Life is full of expectation and dreams, but how sincerely are we actually working on it and how often do we succeed? Why do some people succeed and some hardly succeeds? Answer to this question is perspective, how we look at things around us. A positive approach towards life could result into wonders and is a key element to success. What we think is what we become, our thinking influence our thoughts and action which will ultimately decide our life. We often dream to achieve something, but what mostly holds us back from doing it is lack of willingness, lack of motivation and lack of confidence, these are all different form of negativity. To overcome this there is a very simple solution to it, stay positive in every situation. Staying positive will make you stand apart from others. Having a great idea or having a goal is not enough and definitely not everything. Ideas are simple, but implementing it, staying positive and always believing in it is difficult. If you succeed in it, you can achieve anything and everything you have ever imagined in life. What we think is what we attract and what we get. So it is necessary we always stay positive in life. These Positive quotes which will always help you to stay away from negativity. If you want to achieve your dreams, you need to stay positive right from this moment. Everyone has the potential to achieve their dreams, you need to believe in it work patiently and consistently on it. 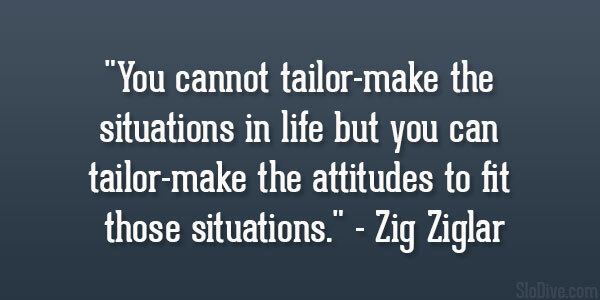 Right attitude is what going to matter. Everyone is going to face more or less same situation at some point in life, positive attitude is what going to make you or break you. This positive quote you must always remember, face your problem instead of running away from it. The difference between a successful person and others is not lack of strength not a lack of knowledge but rather a lack of will. Everyone is having equal resources, but to succeed you need to work on it consistently and always be motivated in what you do. You are never going to lose anything from staying positive; even if you fail you will learn many valuable things. No great thing was ever easy to achieve neither it will ever be, it takes a lot of determination to do what you want, but it is going to make you happy for sure. Staying positively on the right track is not going to enough, you need to constantly work with enthusiasm. Sometimes it becomes difficult to stay positive, in such situation don’t ever give up to negativity, just stay calm and relax things will work out soon. Always keep moving towards your goal no matter how hard things become, don’t ever lose hope. There should be NO option of quitting in your life, even if things are not working well or things are moving too slow, keep on moving things will change nothing is permanent. There is never a perfect plan or timing for anything, if you believe in start working on it from today itself with full dedication. There is no smooth road to success; way to success may be hard but not impossible. Never lose hope midway or get disappoint, it may take time but it is going to work which will ultimately matter. Courage not always roar, sometimes it speaks silently, “I’ll try again” in worst of the situation. I do believe we’re all connected. I do believe in positive energy. I do believe in the power of prayer. I do believe in putting good out into the world. And I believe in taking care of each other. This is an important positive quote to always remember, more the people believe in it more the world will become a better place. Your pasts is over, never look back at it and always look forward in life, there’s a lot of beautiful things waiting for you ahead, live your dream, this is your chance. Hope these quotes will help to bring positivity in your life and remove all sort of negativity from your life, so you could also keep moving ahead in life and build and achieve what you dream, there is no stopping. If you hear a voice within you say you cannot paint, then by all means paint and that voice will be silenced. I hope you enjoyed all these positive quotes and even if these bring a bit of change in your thinking process and in your life that would be great.